What makes MOD2 software for Apparel / Garment Packagers unique? o Ability to manage items per size (i.e. S, M, L, XL). o Ability to manage pre-configured packaged items (pre-pack). o Ability to manage standalone sizes. o Ability to manage ratios. o Ability to suppress ratios. o Ability to manage units/pieces per box. o Ability to have unlimited size ranges. o Ability to show/hide sizes on certain forms. o Ability to auto-pack customer sales orders. o Ability to keep inventory by style, color, date, priority, group & season. o Ability to track customer orders that are lined to garment manufacturers. o Ability to see a time line of productions tasks. 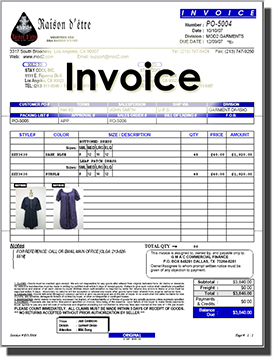 o Ability to manage garment costing. Different sizes of the same style can have different costs. 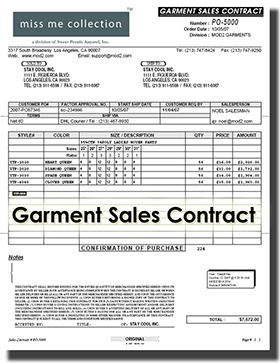 o Ability to generate garment production and processing cost sheet. o Ability to create box details and box shipment summary for packing lists. 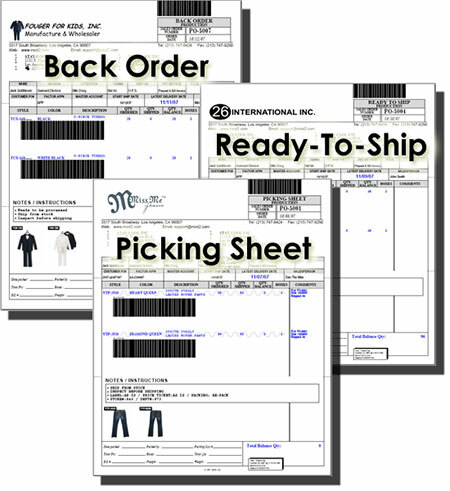 o Ability to group garment items into different categories/labels. o Ability to attach images, documents, POD's, MS Excel Sheets, and emails to inventory items and transactions. Images can be printed on most forms of MOD2. o Ability to generate bar-codes on stickers and forms. o Ability to generate UPC numbers automatically. The MOD2 software provides you with consistent, professional forms like invoices, proforma invoices, commercial invoices, picking sheets, sales orders, purchase contracts, and a lot more forms that follow industry standards. Check out the sample forms and stickers that we have in the MOD2 software.